This guy from Thingiverse is using D-Sub mixed connector for a quick change hotend. I love the idea of moving everything away from the hotend and turn it into a single plug. Could someone help me find the parts? It is just a connector. If you attach wires on both sides it will make a connection. For the high power stuff the bigger connectors seem well suited. To me that connector looks a little bit bulky. You could use a VGA connector and dedicate more pins to the high power components. If I wanted to go that way, I'd run down to the auto parts store and see what they have for connectors. That way you find stuff designed for vibration with some kind of latching mechanism. Or even cheaper or for those who hate crimping: run down to the junkyard and clip some suitable connector pairs out of wiring harnesses, with a few inches of wire each side. Then solder and shrinkwrap your wires. Before I decided on the yellow jacket board, I was going to use bulkhead receptacles mainly because I have access various sizes. The plans were to mount the female connection in the center hole in the top. 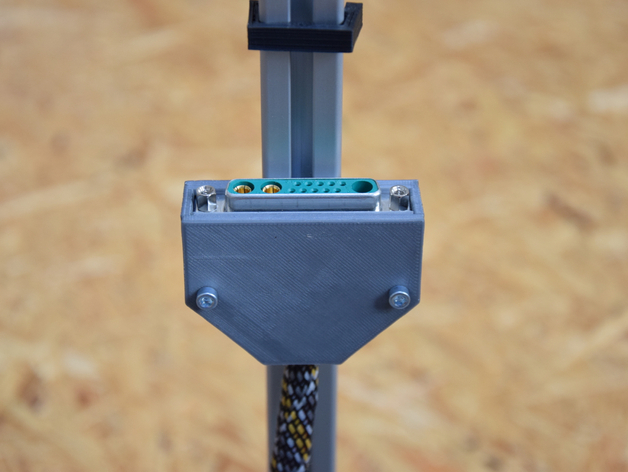 Then the male connector with a long run of wires to the hotend. Anyways, these can be found just about anywhere. Google image "bulkhead receptacle" to get an idea of the different types and sizes. Thanks guys, I'm still looking for a good all-in-one plug. I think that the best to do is go to a electronics store and see what is available.